If you'd like to embrace the spirit of Christmas in Vermont this year, check out these holiday season events and activities from around the state. For many folks, the holidays not only represent warmth and the togetherness of family but also stress, ​much of which can be linked to the pressure to buy gifts. As consumerism wanes, and the priorities of family, health, warmth, and nourishment hold increasing precedence, many Vermonters and visitors from beyond opt to spend their resources celebrating holiday time together, rather than on a rush of wasteful presents (beyond those with meaning and from Santa, of course). Whether you stay at a family home, a vacation rental, an inn or a resort, Christmas and New Year's in Vermont are steeped in tradition and sprinkled with magic. Enjoy month-long holiday cheer displays in the Christmas card town of Middlebury, Vermont. A whimsical hut serves hot chocolate on the town green. Hunt for special items in storefronts with the "I Spy" contest and win "Middlebury Money" through the month of December. Santa arrives on a fire truck in early December. The famed Annual Community Messiah Sing is held at the Congregational Church. New Year's Eve in Middlebury typically features a Count Down to Noon Year for kids at noon, fireworks, ice skating, dancing, and a dinner theater show. If you are in Vermont at Christmastime, don't miss a visit to the 19th-century luminescence displayed at Vermont's rural heritage museum. 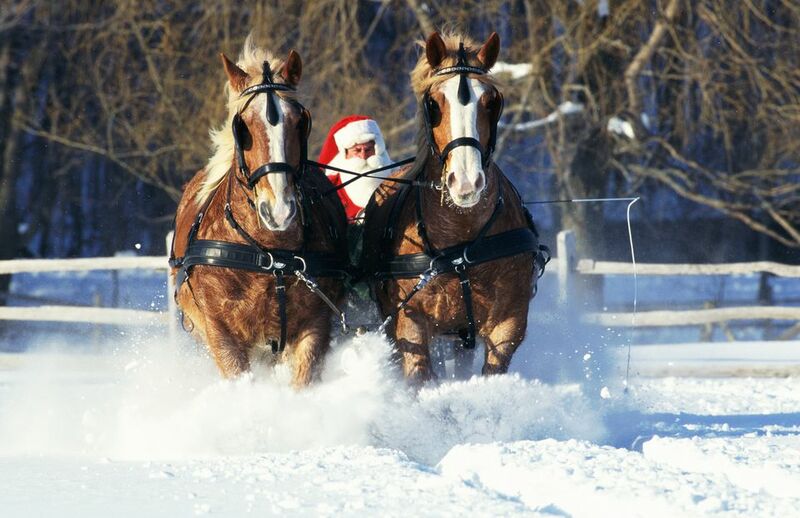 Open weekends in December and daily December 26 through January 1, Billings Farm & Museum in Woodstock, Vermont, offers tours of the authentically decorated farmhouse, plus opportunities to make historic ornaments, ride a horse-drawn sleigh or wagon, and sled with jack jumpers. This lantern parade has grown and grown over the years. The theme for 2018 is "Fantastical Favorite Food: From Farms to Families" and you're invited to make a lantern and march along on December 1, 2018 or simply observe this festive procession featuring creations by both professional artists and school children. The Bennington Museum in Bennington, Vermont, has undergone a makeover, and so, too, has its annual holiday festival. The Festival of Trees was replaced in 2015 by The Festival: Reimagining Grandma Moses. Each piece is up for bid during the festival, which runs November 25 through December 30. Looking for inspired gifts? Be sure to shop in the ​Bennington Museum Store. In 2018, Vermont's 60-voice Onion River Chorus will pair up with a 16-piece Baroque-instrument orchestra to present two versions of the texts "Magnificat" and "Te Deum" by Baroque masters Jan Dismas Zelenka and Antoine Charpentier. The concerts will be held on December 22 and 23, 2018. When the tinsel starts clogging the vacuum, the recycle bin is overloaded with wrapping paper, and the drying balsam needles are sticking to your socks, it is time to explore your New Year's Eve options. Vermont has plenty to offer. Popular, family-friendly First Night events can be found in Burlington and Saint Johnsbury. Ski areas like Jay Peak host big parties as well.